The darkness of the night is pushed across the sky, tailed by a blur of pastel colours – this is how the night makes way for the dawn of a new day. It is this subtle changing of the world, the first rays of light, that signal to our bodies to rejoin the waking world. Sleep melts slowly away as the sun steadily climbs. The light’s power to persuade our bodies to participate in the world is so much like the reaction Chrysanthemums elicit in us, as the new year dawns. Bursting with brightness and available in all shapes and sizes, Chrysanthemums potted will add a subtle but immensely powerful spark of life to a room. Their variety of colours, affordability, and easy care instructions make them an ideal and dependable option for anyone! 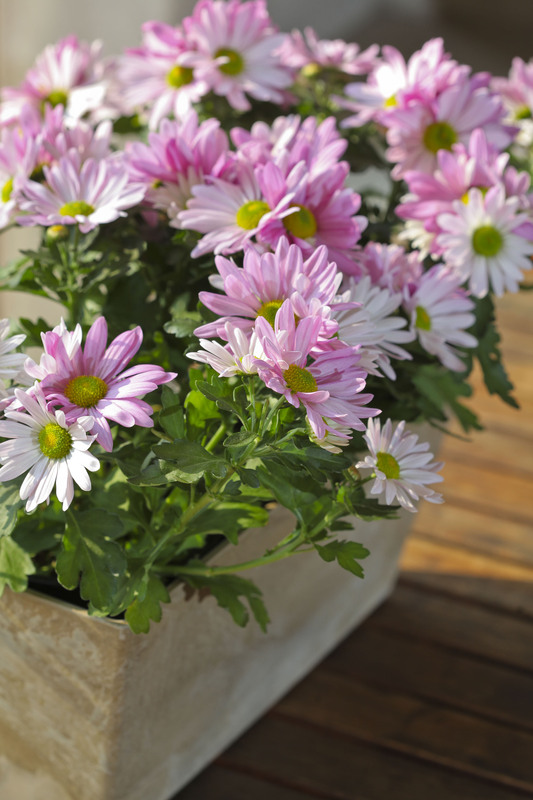 Chrysanthemums come in a variety of shapes and colours. They typically grow to 30cm in height. Select a space for them to grow into, as they may be slightly shorter at your time of purchase. Their spread will be about the same, bushing out to around 30cm. Their flowering season is from spring through to autumn – giving you 3 seasons’ worth of beauty. After their flowering season is over, it is best to plant them in the garden. At the end of their flowering season, they will die back. Simply deadhead them and leave the stalks. The following spring, they will regrow and the entire bush will increase in size. This will continue each cycle until the bush reaches its maximum height and width. In some cultures, Chrysanthemums symbolise motherhood, rebirth, and life – the perfect gift for someone who has just had a baby. In Europe, Chrysanthemums are given to symbolise sympathy, while in America they represent honour. The colour of the Chrysanthemum is also symbolic. Yellow Chrysanthemums represent neglect of love – or sorrow. White represents loyalty and devotion. Red, like roses, represents love. Love, longevity, and happiness are the emotions that are generally associated with Chrysanthemums – which is evident because that’s precisely the feeling they bring into the home! Add a beautiful pot that blends with the theme of your decor. Often, a dark coloured stoneware look helps to accentuate the brightness of the flowers. If you struggle to commit to a colour of Chrysanthemums, pick a number of colours, there’s no need to choose – they’re fun and richly rewarding.